Two years ago, had you asked me and my then-boyfriend where we would someday hold our wedding, we may have said in the Midwest, where we live, or more likely, Asia, where we had traveled extensively together. But destiny — disguised as Google — had other plans for us. friends and then started dating in college. Throughout our relationship, unpredictability has been our modus operandi, and post-graduation we ended up in living in San Francisco. But we still felt the itch to travel. And though we had explored much of the States and Europe together, we’d never tackled Asia. So late one night in December 2007, we booked a pair of one-way tickets to Shanghai. Six months later we quit our jobs and, with one backpack apiece, set off for a yearlong adventure that would take us through nine countries – including Singapore, where Tyler popped the question. Upon returning to the United States in June 2009, we moved again, this time to Chicago, our current home, and we were soon hit with an onslaught of questions about when and where we planned to tie the knot. Our imaginations immediately turned to exotic locations such as Nepal and Vietnam. But after realizing a wedding in Asia would be difficult to pull off for most of our family and friends, we started looking closer to home. Our next thought: Las Vegas. It offered easy air access for friends and family, boasted multiple venue options and held no shortage of things to do pre-and post-ceremony. But about two weeks into planning, as we were preparing to sign a contract with a big-name Vegas hotel, things started falling apart. Dates weren’t working, vendors weren’t returning our calls, and it just wasn’t feeling right. Still thinking Sin City, a frustrated Tyler typed Palms wedding into Google on a whim, hoping to find info on the Palms Casino Resort; he’d previously seen photos of the property and thought it looked promising. He clicked on the first link, and the images that appeared on the screen grabbed our attention instantly: palm trees, tropical gardens — and an ocean? little research, we found that just like the hotels in Vegas, The Palms offered an attractive wedding package, but with an added boon: guaranteed sand and sun. We’d never imagined ourselves getting married in a beach destination, but as the idea began to take hold in our minds, we realized our guests would love some South Beach fun. Although we’d never stepped foot in Miami, we called and booked the venue three days later, with a wedding date of May 22, 2010.
hands in every decision, and The Palms’ staff — namely our coordinator, Nathalie Merle — made the process painless. We didn’t have time to travel to Miami before the wedding, but she assured us that the event would go o! without a hitch and happily answered all our phone calls. By the time I met her in person, I felt like I was reuniting with a dear friend. We wanted to keep our celebration small and were delighted when 67 of our loved ones agreed to make the trip from nine different states. The weekend started Thursday night with my bachelorette party, a lively evening that included dancing on tables at Taverna Opa restaurant. The dancing continued on Friday: After our rehearsal dinner, held in a gorgeous private room at Larios on the Beach, our group headed downstairs and cut a rug to salsa music. At our ceremony the next day, classical ensemble Eleganza Strings played Pachelbel’s “Canon in D” as I walked down the steps from The Palms’ terrace arm-in-arm with both of my parents. Then I followed the rose petal-strewn aisle to the garden gazebo. One of our best friends performed the service, and we exchanged our own vows — which, true to form, we both wrote earlier that day. Afterward, everyone moved to the hotel’s terrace for a cocktail reception featuring seafood empanadas and sushi. Then our guests spilled into a ballroom lit by candles and lanterns. Although it hadn’t been feasible to marry abroad, we still wanted to acknowledge our experiences there, so we labeled each reception table with a picture of us in a different country and a description of what the location meant to us — a fitting blend of our faraway dreams and our rewarding decision to stay stateside. Following a delectable dinner of Caribbean mahi mahi, the entire party — including my groom and me — loaded onto the dance floor and let loose. Somewhere between the Black Eyed Peas, Lionel Richie and Daft Punk, Tyler and I shot each other a knowing, happy look: Thank goodness for Google! 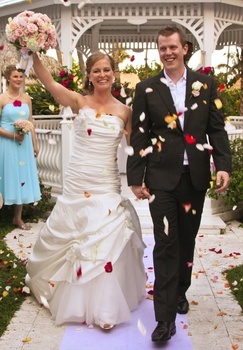 Katie Morell and her husband, Tyler Myhan, getting married at The Palms Hotel in Miami, Florida.